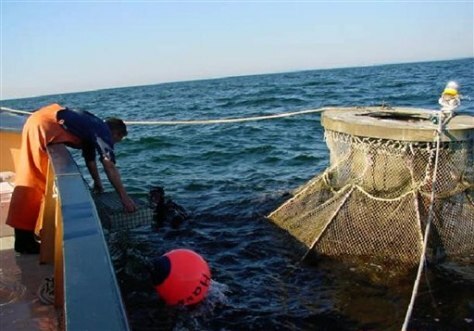 In this September 2002 photo provided by the University of New Hampshire Open Ocean Aquaculture Project, a crewman passes a transfer cage of young Atlantic halibut to a diver for stocking into the offshore fish cage, right. The top of the fish cage, usually submerged, is above the water's surface only for the purpose of transferring or harvesting. The aquaculture program is experimenting with the potential for offshore fish farming.